Indian water closets in the market. We offer various types of Indian water closets like ceramic water closets, toilet closets etc. Our Indian water closets are available at affordable prices. Backed with rich extensive experience, we are engaged in manufacturing, exporting and supplying Sanitary Wares. Our range of products includes Wash Basin With Pedestal, European Water Closet and Squatting Pan. All these products are offered in different models at pocket friendly rates. Our washbasins are available in varied attractive shades and colors such as pink, white, red and blue. In addition, we also offer customized versions of these products as per the specifications given by our patrons. Our expertise also lies in offering waterproof bathroom accessories that are extremely attractive and smooth. These products are widely acknowledged for their features durability, high strength and robust construction. 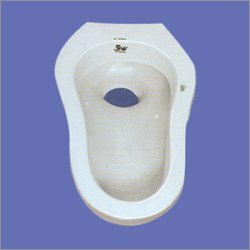 In addition, we also bring forth for our clients Indian Water Closet, Wash Basin and Other Accessories. To tap up the untapped potential of this industry, we have developed a strong and sophisticated manufacturing unit. This unit is armed with all the latest machines and tools that enable us to produce 2500 pieces per day. For prompt delivery of the products, we have established an extensive supplying network. Our enterprise is managed by a group of industrious professionals, which is appointed for meeting the targets and goals of the organization. It is due to our wide network base and efficient professionals that we have catered to various patrons based in the Indian market.